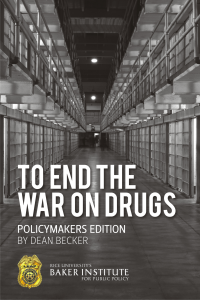 In his book, "To End the War on Drugs: Policymakers Edition," Dean Becker, a contributing expert in the institute's Drug Policy Program, has selected and skillfully arranged segments from interviews he has conducted with a wide range of drug policy experts since 2000, together with his own insights to provide readers with a clear and compelling account of the myriad failures of the War on Drugs and sensible guidelines for moving beyond it. Becker has interviewed more than 1000 people for his Drug Truth Network programs that originate on Houston’s KPFT and are carried by more than 70 stations throughout the country. 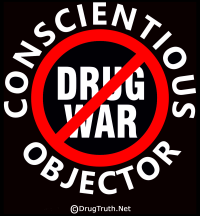 “For decades, Dean Becker has given himself over to the cause of sane and sensible drug policies. In ‘To End the War on Drugs’, he explains his passion for reform, and tells us why he’s been willing to make sacrifice after sacrifice to end this country’s disastrous drug war. Along the way, we hear from scores of reformers (and more than a few apologists for U.S. drug policy). But it is Dean’s voice that comes through loud and clear as he makes a strong, compelling case for an end to the War on Drugs.” – Seattle Police Chief (Ret) Norm Stamper. On July 18, 2014, Dean Becker held a press conference in a U.S. House of Representatives hearing room to introduce the book, which was distributed to every member of Congress, President Obama and members of his cabinet, the justices of the U.S. Supreme Court, and the governors of all 50 states, with the assistance of the Baker Institute, Law Enforcement Against Prohibition (LEAP), and Students for Sensible Drug Policy.